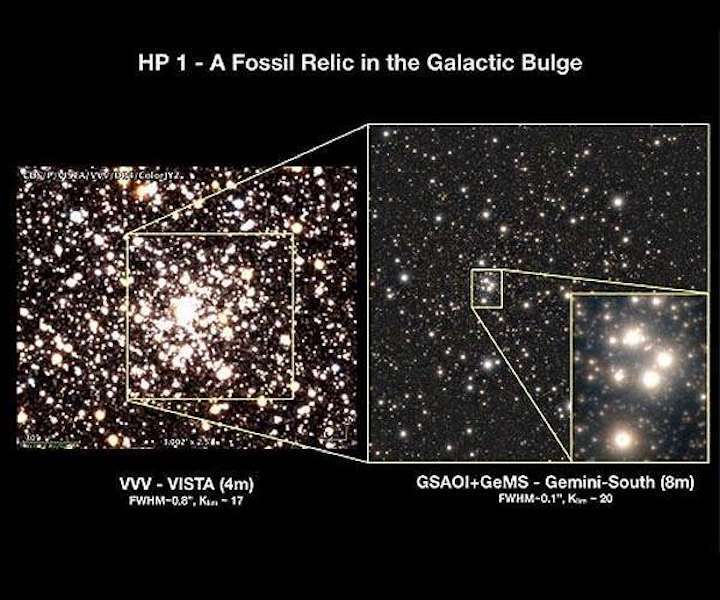 GSAOI+GeMS color composite image of HP 1 (right image) shown relative to the full field of the cluster obtained by the Visible and Infrared Survey Telescope for Astronomy (left). Credit: Gemini Observatory/NSF/AURA/ VISTA/Aladin/CDS. Just as high-definition imaging is transforming home entertainment, it is also advancing how astronomers study the universe. "Ultra-sharp adaptive optics images from the Gemini Observatory allowed us to determine the ages of some of the oldest stars in our galaxy," said Leandro Kerber of the Universidade de Sao Paulo and Universidade Estadual de Santa Cruz, Brazil. Kerber led a large international research team that published their results in the April 2019 issue of the Monthly Notices of the Royal Astronomical Society. Using advanced adaptive optics technology at the Gemini South telescope in Chile, the researchers zoomed in on a cluster of stars known as HP 1. "Removing our atmosphere's distortions to starlight with adaptive optics reveals tremendous details in the objects we study," added Kerber. "Because we captured these stars in such great detail, we were able to determine their advanced age and piece together a very compelling story." "This star cluster is like an ancient fossil buried deep in our galaxy's bulge, and now we've been able to date it to a far-off time when the universe was very young," said Stefano Souza, a PhD student at the Universidade de Sao Paulo, Brazil, who worked with Kerber as part of the research team. The team's results date the cluster at about 12.8 billion years, making these stars among the oldest ever found in our galaxy. "These are also some of the oldest stars we've seen anywhere," added Souza. "HP 1 is one of the surviving members of the fundamental building blocks that assembled our galaxy's inner bulge," said Kerber. Until a few years ago, astronomers believed that the oldest globular star clusters - spherical swarms of up to a million stars - were only located in the outer parts of the Milky Way, while the younger ones resided in the innermost galactic regions. However, Kerber's study, as well as other recent work based on data from the Gemini Observatory and the Hubble Space Telescope (HST), have revealed that ancient star clusters are also found within the galactic bulge and relatively close to the galactic center. Globular clusters tell us much about the formation and evolution of the Milky Way. Most of these ancient and massive stellar systems are thought to have coalesced out of the primordial gas cloud that later collapsed to form the spiral disk of our galaxy, while others appear to be the remnant cores of dwarf galaxies shredded by the gravity of our Milky Way. Of the roughly 160 globular clusters known in our galaxy, about a quarter are located within the greatly obscured and tightly packed central bulge region of the Milky Way. This spherical mass of stars some 10,000 light-years across forms the central hub of the Milky Way (the yolk if you will) which is made primarily of old stars, gas, and dust. Among the clusters within the bulge, those that are the most metal-poor (lacking in heavier elements) - which includes HP 1 - have long been suspected of being the oldest. HP 1 then is pivotal, as it serves as an excellent tracer of our galaxy's early chemical evolution. "HP 1 is playing a critical role in our understanding of how the Milky Way formed," Kerber said. "It is helping us to bridge the gap in our understanding between our galaxy's past and its present." "These results crown an effort of more than two decades with some of the world's premier telescopes aimed at determining accurate chemical abundances with high-resolution spectroscopy," said Beatriz Barbuy of the Universidade de Sao Paulo, coauthor of this paper and a world-renowned expert in this field. "These Gemini images are the best ground-based photometric data we have. They are at the same level of HST data, allowing us to recover a missing piece in our puzzle: the age of HP 1. From the existence of such old objects, we can attest to the short star formation timescale in the galactic bulge, as well as its fast chemical enrichment." To determine the cluster's distance, the team used archival ground-based data to identify 11 RR Lyrae variable stars (a type of "standard candle" used to measure cosmic distances) within HP 1. The observed brightness of these RR Lyrae stars indicate that HP 1 is at a distance of about 21,500 light-years, placing it approximately 6,000 light-years from the galactic center, well within the galaxy's central bulge region. Kerber and his team also used the Gemini data, as well HST, Very Large Telescope, and Gaia mission data, to refine the orbit of HP 1 within our galaxy. This analysis shows that during HP 1's history, the cluster came as close as about 400 light-years from the galactic center - less than one-tenth of its current distance. "The combination of high angular resolution and near-infrared sensitivity makes GeMS/GSAOI an extremely powerful tool for studying these compact, highly dust-enshrouded stellar clusters," added Mattia Libralato of the Space Telescope Science Institute, a coauthor on the study. "Careful characterization of these ancient systems, as we've done here, is paramount to refine our knowledge of our galaxy's formation." Chris Davis, program officer at the National Science Foundation (NSF) for Gemini, commented, "These fabulous results demonstrate why the development of wide-field, high-resolution imaging at Gemini is key to the observatory's future. The recent NSF award to support the development of a similar system at Gemini North will make routine super-sharp imaging from both hemispheres a reality. These are certainly exciting times for the observatory." The Gemini observations resolve stars to about 0.1 arcsecond which is one 36 thousandth of a degree. This is comparable to separating two automobile headlamps from approximately 1,500 miles, or 2,500 kilometers, away (the distance from Manaus to Sao Paulo in Brazil, or from San Francisco to Dallas in the USA). This resolution was obtained using the Gemini South Adaptive Optics Imager (GSAOI) - a near-infrared adaptive optics camera used with the Gemini Multi-conjugate adaptive optics System (GeMS). GeMS is an advanced adaptive optics system utilizing three deformable mirrors to correct for distortions imparted on starlight by turbulence in layers of our atmosphere.